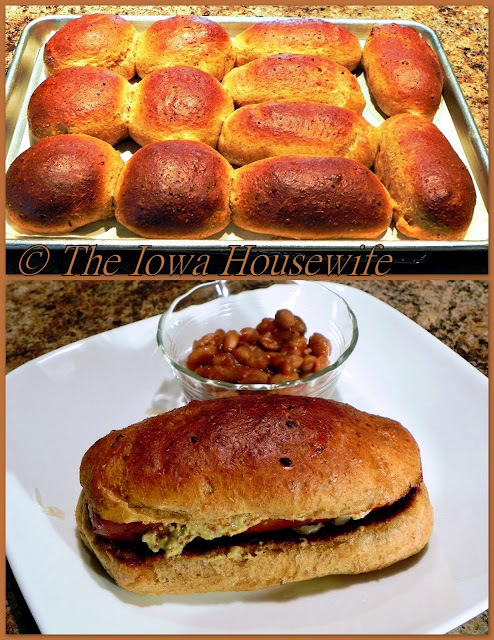 Here are some wonderful, soft, tasty, good-for-you high protein buns. Each bun, if made into a dozen, has 10 grams of protein. I use lard from our local locker plant that is NOT hydrogenated; if you don’t have this kind of lard, use butter. You can substitute honey for the molasses for a different flavor. I usually use coarse whole wheat (graham) flour because we like the texture. I make these when cottage cheese is on sale; use full-fat or it will get rubbery when baked. Don’t worry if you can still see some curd in your shaped dough, it disappears when you bake the buns. I try to always keep a few buns in the freezer for quick lunches when we’re busy; I can pull out a couple and they defrost in short order. In mixer bowl, combine 6 3/4 ounces (1 1/2 cups) all purpose flour, lard, yeast, salt and soda. Heat cottage cheese, 1/2 cup water, molasses until warm (120° to 130°); add to ingredients in bowl. Add 1 egg. Blend with mixer at low speed for 1 minutes. Beat at high speed for 3 minutes. Add wheat flour, mix in, then add remaining cup of all purpose flour until dough pulls away from sides of bowl. Change to dough hook and knead 6 minutes or knead by hand up to 10 minutes. Let rise 15 minutes, covered, in warm place. Divide into 12 pieces, 3 1/2 ounces each or 14 pieces, 3 ounces each. Shape into balls and place on greased or parchment lined half sheet, 2 inches apart. Flatten into 4" circles or shape into 6" brat buns. Cover pans and let rise 25-30 minutes while preheating oven to 375°. Brush dough with 1 egg mixed with water, carefully, just before baking. Bake 18-20 minutes on lower oven rack or until an instant-read thermometer says 200°. Cool on rack. Split before freezing. *Shape dough into 18 pan rolls in a 13 x 9" pan if desired (2 1/4 ounces each). 2016 Cost: $3.22 a dozen or 27¢ each. Do you use the small curd cottage cheese? Yes, I use it because that's what we like to eat if I have any left over. These look great, I'll have to try them. I like roasted veggie sandwiches, usually without cheese, but wonder about getting enough protein in such a meal. This is an ideal bread to use for that. They're perfect for sandwiches like that...you'll like them.